Background Despite cybernetics' short, incandescent life as a scientific knowledge, it has had an enduring cultural legacy. 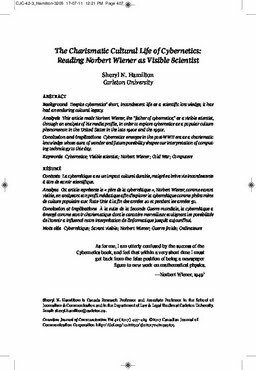 Analysis This article reads Norbert Wiener, the "father of cybernetics," as a visible scientist, through an analysis of his media profile, in order to explore cybernetics as a popular culture phenomenon in the United States in the late 1940s and the 1950s. Conclusion and implications Cybernetics emerges in the post-WWII era as a charismatic knowledge whose aura of wonder and future possibility shapes our interpretation of computing technology to this day.